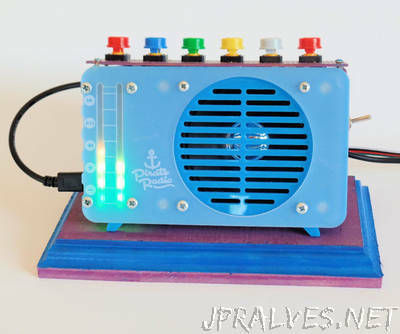 “This Instructable shows how to modify Pimoroni’s excellent Pirate Radio kit to add an enclosure and switches that you can use to control the Pirate Radio functions. Pimoroni supplies software for different projects: an internet radio, a Spotify streaming box, or an AirPlay speaker. I particularly like the Internet radio option. As configured the Pirate Radio comes with a speaker and plays in mono mode, but you can also use it with external speakers in stereo. I like the tone the external speakers provide. The Phat Beat has small switches for its various functions and LEDs that function as a VU meter. In this Instructable we will add larger button switches on the top of the Pirate radio and a power switch on the side. No changes are required in the code to make these switches work.